Gingivitis in dogs is an inflammation of the gums and is the early stage of a gum disease called periodontal disease. It is very common in dogs and is treatable, though if left untreated, it can develop into advanced periodontal disease, which can lead to teeth loss. Gingivitis is caused by bacteria that accumulates due to plaque and tartar buildup. The inflammation of the gums may become more severe and painful, and the gums may even start to bleed. Gingivitis is preventable in dogs with regular, at-home teeth brushing and occasional professional teeth cleanings, just as it is in humans. Many dog owners, however, do not give enough thought to their dogs’ dental health until it is too late. If you see the signs of gingivitis in your dog, ask your veterinarian about treatment and how to care for your dog’s oral health at home to prevent further gum disease. 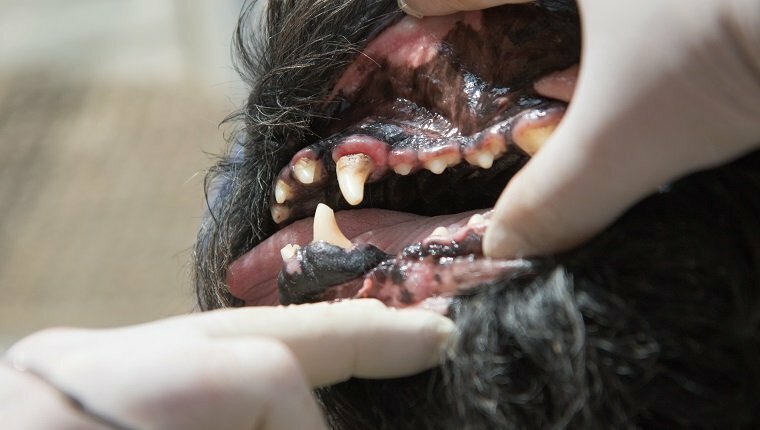 Here is what you should know about the symptoms, causes, and treatments for gingivitis in dogs. 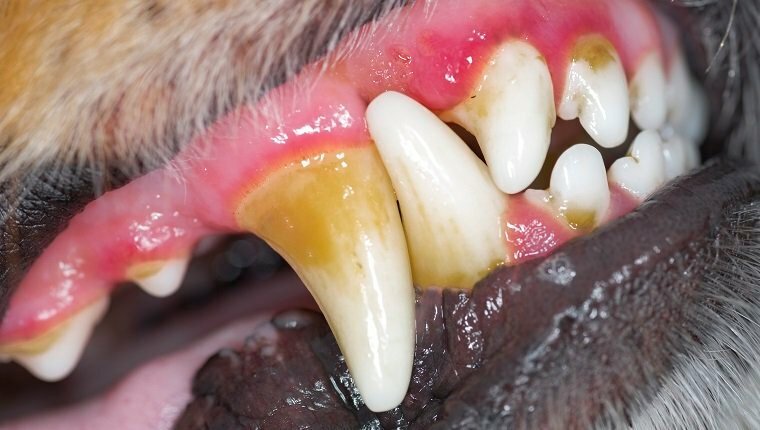 The symptoms of gingivitis in dogs may start out with mild inflammation of the gums at first, but as the gum disease progresses, symptoms will become more severe and noticeable. If your veterinarian sees the signs of gingivitis in your dog, they may recommend professional teeth cleaning and advise you on how to maintain your dog’s oral hygiene at home. Here are some common symptoms of gingivitis in dogs. 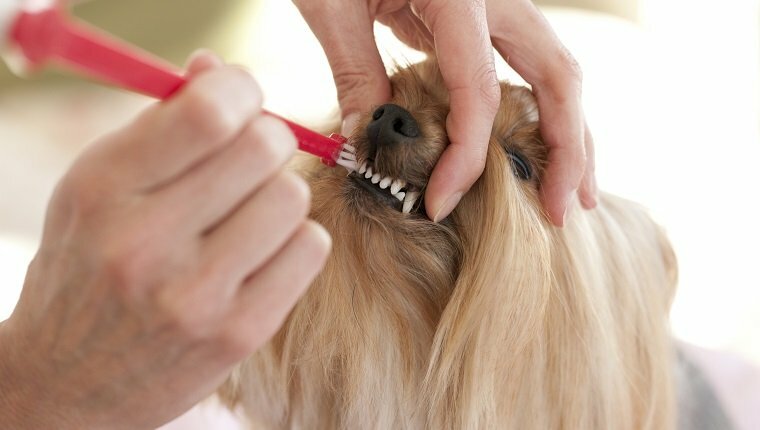 The main causes of gingivitis in dogs are poor diet and a lack of oral hygiene, though certain dogs who have crowded teeth–such as toy breeds–and dogs who groom themselves are at greater risk for gum disease. 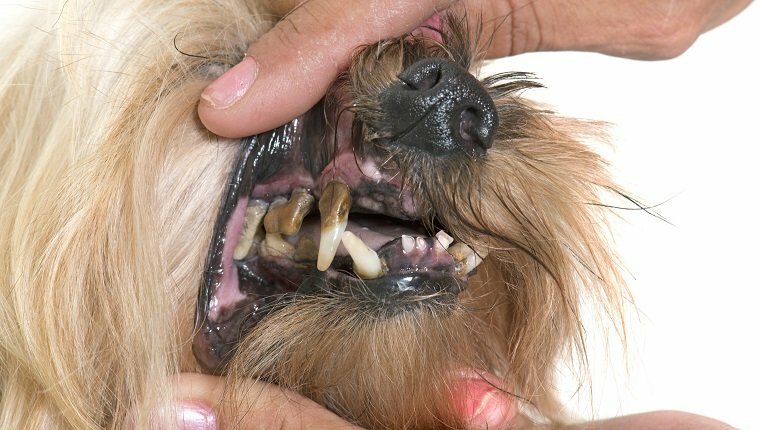 When a dog’s teeth and gums are not properly cared for, food particles and bacteria build up in crevices between the teeth and gums, causing inflammation and irritation. As the bacteria grow in number, they stick to the teeth and form plaque, which calcifies and becomes tartar. The more this happens, the more the gums are pushed away from the teeth, exposing pockets where more food and bacteria get caught. Without proper cleaning, this will lead to periodontal disease and a loss of teeth. Treatment for gingivitis in dogs starts with a professional teeth cleaning where tartar deposits are removed and the teeth are polished. This will help prevent bacteria from clinging to the teeth in the future. Dogs who have a professional teeth cleaning usually go under anesthesia for the process. In severe cases of gingivitis, part of the gum tissue may be removed. If there is a bacterial infection, an antibiotic may be prescribed. Your veterinarian or dental specialist will likely advise you on home treatment to prevent further gum disease. This will include regular teeth brushing and rinses. Your vet may prescribe special toothpaste, gels, or formulas depending on your dog’s specific condition. Chew treats and toys also help remove plaque from teeth. You should take care of your dog’s teeth just as you do for your own teeth to prevent gum disease. How do you care for your dog’s teeth and gums? Let us know in the comments below!